I'm not sure why I expected anything different, but decorating our Christmas tree was chaotic this year. My husband carried the bin of ornaments up from the basement, and the girls descended upon it, grabbing, jostling, and announcing, "I remember this one!" Ornament hooks spilled and embedded their way into the carpeting. The lower half of the tree received 90% of the ornaments. Partially through I considered that we should be more festive and less rushed. I had forgotten to turn on Christmas music. The rest of the house was a mess. Everything was happening too fast. Instead of being thoughtful and deliberate, we were colliding our way into Christmas. And, realistically, I was the only one who was bothered by this. Not my husband. Certainly not my kids. They were too busy hanging bulbs and angels, too caught up in the glittered and mismatched ornaments that they had made during Christmases past, too curious as they looked at Baby's First Christmas pictures and wondered which one was them. No, it was just me. In my mind, I had a picture of what a house should look like when a Christmas tree is decorated, and that mental picture didn't include a kitchen table that hadn't yet been cleared from lunch, or a sink full of dirty dishes, or a family room carpet that was in dire need of vacuuming. Each year I somehow expect that I'll feel entirely prepared for Christmas each year -- that presents will be neatly wrapped in advance, and we'll host dinner parties where I'll wear something with exactly the right amount of sparkle, and I'll have uninterrupted time to reflect on the real meaning of the season in an organized and tastefully decorated environment. That never seems to happen, though. Instead, there are brief moments of Christmas wonder in the midst of regular life. My kids pile onto the couch and we share one blanket as we stumble upon the second half of A Christmas Carol on TV. I overhear my youngest talking to the Baby Jesus figurine in the manger. We take a detour to pass the "crazy house" that has hundreds and hundreds of lights. Christmas will never slow down for us. 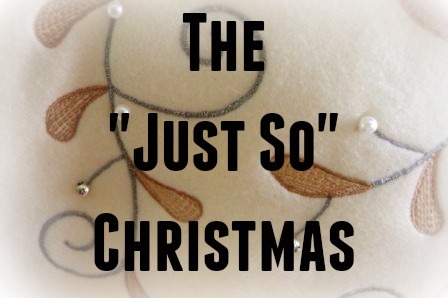 It's never going to be "just so." I'm the one who needs to slow down and discover those moments of holy wonder, reflection, and worship right in the midst of regular life. I like things "just so". I am a perfectionist, yet can't ever seem to get things just perfect. I feel like I fail constantly. But, then I remember I am loved no matter how 'unperfect' I am. God is the only perfect thing. I need to remind myself of that. Yes and amen, Carol. I relate, as I'm also a perfectionist who can't get things perfect -- and yet I'm loved, even in my markedly "unperfect" state, but a remarkably perfect God. We ALL need to remind ourselves of this. Thank you for you wise and true words! So true! Putting up our tree was almost the exact same experience! Yup, our Christmas tree experience felt the same. No music over here either. I love this Robin. You and I are so much alike... it's stunning. I found my Christmas tree experience to be very similar... plus I always have an epic battle with the lights which usually ends with my husband telling me to relax and chill out. Ahhh yes, the ornaments. I used to rearrange them after the kids were done but now I let it be because they'll be moving them around all through the Christmas season. So, I remind myself that it's not the Christmas tree, the cards, the gift wrap, or even what we do... it's our love for God and the anticipation of him that makes the season. Somehow that refocus helps me breathe and gives me the serenity I need to place that last strand of lights on the tree. You speak my HEART every single year!!! It reminds me of a beautiful book I was blessed to review.... "Savoring Christmas"... in it Stacy has a chapter about how the first Christmas wasn't at all perfect- and it's not supposed to be this way perspective shifts when we think about the reality of life and how it's never really presented perfectly. I love this so much because it is TRULY how I feel about wanting things to be just so... and they never ever are!! I do hope you had a blessed Christmas despite its imperfections, Robin! !